Don't be fooled by the foreign sounding name. This might be the easiest elegant dessert you will ever make! I am all about easy so this was a no brainer. 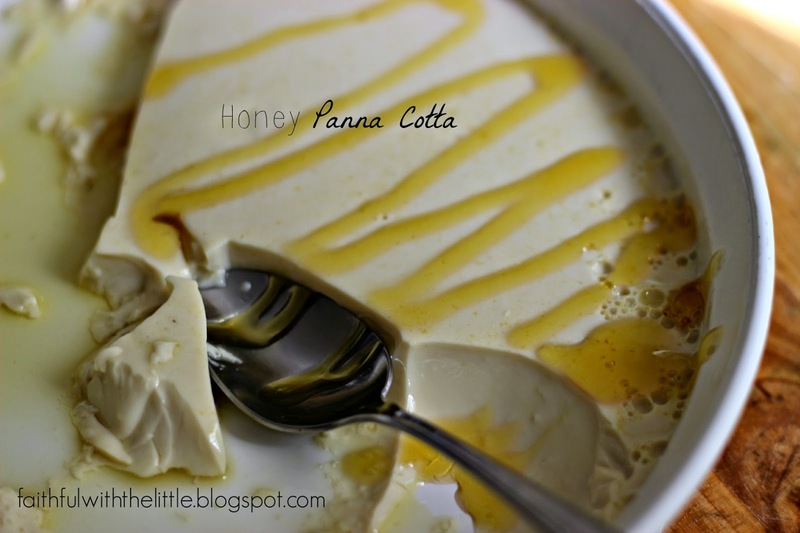 I came across a recipe for maple panna cotta and thought why couldn't I exchange the maple for honey? Thanks to a little help from Wikipedia I learned that panna cotta( Italian for cooked cream) was traditionally made with honey after all. I guess my instincts weren't too far off, though they used to boil fish bones to thicken it. I'll stick to gelatin, thanks! My husband keeps bees in our back yard( I just help eat the honey) so I am always looking for ways to incorporate honey into everything. Not only is it good for you but it is pure goodness on your taste buds. I love rich creamy desserts; think ice cream and panna cotta is right up there with it. Paired with honey it fits all my sweet tooth needs. Though this is a very simple recipe it does take 2 hours to chill, so make sure to prepare it in advance and it will be ready when your after dinner (anytime) cravings start. With thanksgiving right around the corner this will be another great dessert to be thankful for! 1. Pour honey into a pot and simmer just until it heats through and isn't so thick. Whisk in half-and-half. 2. Remove from heat. Stir in gelatin. Let stand 5 minutes. 3.Warm over low heat; whisk until gelatin is dissolved( do not bring to boil) Whisk in vanilla and salt. 4. Pour mixture into bowls or tart dish. ( I used a 27cm round dish) Cover with plastic wrap. Refrigerate until set, about 2 hours or up to 3 days. Makes 4 servings. Serve with whip cream or berries if desired, but it's pure decadence all by itself! Yum, thanks for sharing the recipe!